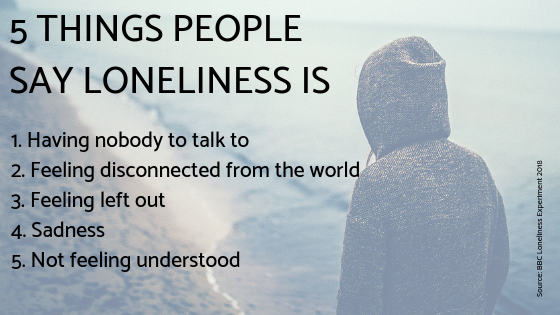 The BBC has just released their findings from the world's largest loneliness study. 55,000 people took part in the BBC's Loneliness Experiment in collaboration with the Wellcome Collection. The people who took the survey were asked how they would define the feeling of ‘loneliness’. The results were surprising. In fact, being around people or not has no bearing on loneliness. Instead, it’s a more complex notion. In the top five responses, for example, was that people felt loneliness was simply not feeling understood. Evolutionary psychologists tell us that since the dawn of civilisation, humans have collected in tribes of like-minded people to survive and thrive. We know from research that a key determinant of a tribe was actually defined by accent. Our ancestors would recognise their fellow tribe members not so much from aesthetics, but from how they sounded. In fact, psychologists would go so far as to say that people’s brains were built to differentiate how one spoke, and classify them as ‘other’ or ‘same’ simply by listening to their accent. Fast forward to modern day, and we might think that the melting pot nature of our lives in the big city would wipe out this particular distinction, and for some of the more multicultural among us, yes this is true. However, it is still a part of our basic mammalian brain, that we judge people as in or outside of our tribe by how they sound. And for people speaking English as non-natives, this can be very alienating. Take Martha for example - a brilliant executive doing well in a high flying job in the city. To anyone from the outside, it looks like she has it all. However, in her more secret moments, she admits that she feels desperately lonely. She has the job, the boyfriend, the nice house and the paycheck. But despite being here for three years, she still struggles with feeling like people don’t understand her, both literally - she finds she prefers emails to spoken communication, and more figuratively. She feels that while she has people she would call her friends, she has still not found her tribe. And part of it is, that she feels that a lot of her colleagues at work (where she spends a minimum of 12 hours a day) see her as different from them. But how do we recognise ‘our people’? Well, research has shown that babies start to have an affinity for others who speak their native language and accent. As we grow up, learning one (or more) languages, the muscles that create the particular vocal sounds of that accent become accustomed to certain movement pathways. For example, the open-mouthed extended ‘I’ (as in stripe) or the smiling, short ‘i’ (as in strip). These get stored in our muscle memory and become automatic. If you are learning a new language, it can be difficult to overcome those automatic muscle memory responses and learn new sounds, let alone their intonation, stress and rhythms in speech. That’s why accents are much harder to shake than merely learning new rules of grammar or lists of vocabulary. But is the answer to feeling understood simply about having the same pronunciation? Surely it is possible for a person to overcome accent barriers socially, among friends? To find people who are willing to work with them, and draw out meaning in discussions by enlisting empathy, sympathy or interest. But what if you’re in an environment where you can’t choose your social circle? Somewhere like the workplace, where exchanges are fast-paced, direct and often results oriented. An accent may create a hurdle not only to a particular task or goal but also can make integration into a work ‘tribe’ very difficult. The accented speaker may feel ‘othered’ by native speaking colleagues, and this can be very isolating and frustrating. You might think that accent softening is about eradicating differences in the way we talk, when in fact, at London Speech Workshop, we concentrate on helping a person to assimilate with native speakers without losing the charm of their original accent. Accent is an important part of our identity, but we don’t want it to create a barrier to entry. Our main purpose then is less around getting rid of an accent (quite frankly, not necessary) and more about helping our clients be masters of the language. So they can use English to achieve their goals and visions, in work and outside of it. This works by giving clients a set of tools that reduce misunderstandings and also help clients to recreate the melody of English. Many of these tools tap into a subtle yet specific point. For example, one challenge many non-native English speakers have when they approach the English language is that they don't know how to channel their energy through their speech, so their passion and enthusiasm is diverted through their gestures and body language, which can lead to their listeners feeling swept up in what they are saying, but not fully understanding it. In English, vowels create the space within words to inject your feelings, and it’s in their utterance that we connect with others. On top of finding one’s way in a new country and settling into a new culture, being a foreign national in the UK can be daunting because the territory of the English language is so full of pitfalls. A taster session with one of our coaches will establish how to avoid them. A course of sessions will address any established wrong turns, and help to familiarise a speaker with the terrain of sounds so that he no longer feels as if he is trespassing on uncharted soil. Ultimately, providing a detailed map that will help not only navigate the pronunciation of words, and the melody and rhythm of speech, but help the speaker to project themselves better. Breaking down the barriers of access that previously rendered them stranded and alone. Because feeling understood is so much more than just being understood.